We use recycled plastic mailers and all packing materials we use are recycled. Packaging doesn't have to be fancy. It just needs to keep your goods good while en route! A few months ago we wrote an email about our glass and steel straws. 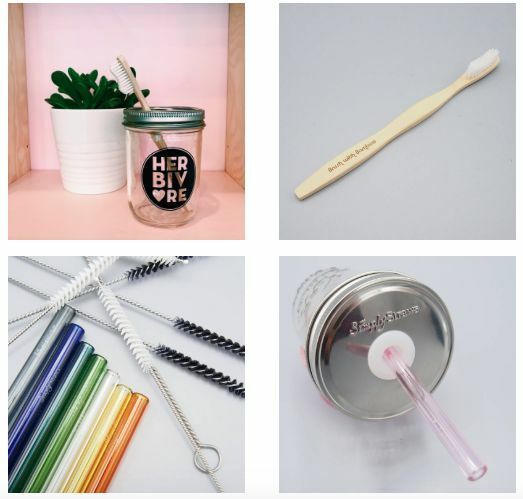 Since then, we've added bamboo straws and other items that are typically plastic but that have fabulous, plant-based and more earth-friendly options. Plus, it seems like EVERYWHERE folks are leaving plastic straws behind. We are stoked! Every single day in the US we use over 500 million plastic straws, and around the world, 2 MILLION single-use plastic bags are distributed every minute. EVERY MINUTE! Simply say NO to a plastic straw when eating out. Use those water bottles that are in the kitchen cabinet and say NO to a five gulp bottle of H2O that costs $1 or more when you're out and about. Put an Herbivore sticker on that old reusable one to make it good as new!